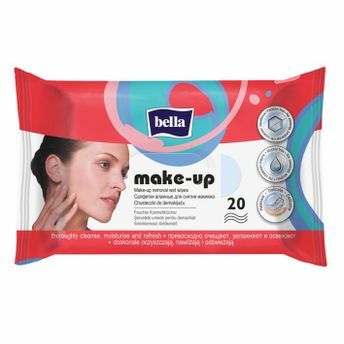 Bella make-up removal wet wipes 20 are ultra-comfortable hygienic wet wipes that stimulate the process of skin functioning and regeneration. Wet wipes designed for convenient make up removal. Wet wipes for universal usage at home and when travelling. Made from very soft material. Contain special substances with ions of magnesium, zinc and copper to clean the skin quickly and perfectly. Additional Information:Bella focuses on providing internationally standard products that take immense care of your hygiene issues and Bella refreshing wet wipes a10 Bella make-up removal wet wipes 20 takes that commitment really seriously! Explore the entire range of Face Wipes available on Nykaa. Shop more Bella products here.You can browse through the complete world of Bella Face Wipes .